One of the challenges of the education profession is the lack of a standardized professional vocabulary. Doctors, lawyers, car mechanics, barbers and IT workers have them — if I say "mullet," "French braid" or "flat top," I bet you have pictures in your head that are the same as the next person. However, get a room full of educators and ask them about digital learning, blended learning, hybrid learning, personalized learning or individualized learning, and you'll likely end up with more definitions than people in the room. This lack of a standard vocabulary is particularly noticeable, and particularly important, in the ongoing conversation about technology use. When and how is using technology in learning a good idea? If your district adopts a model that gives you a common vocabulary, that conversation is much easier. There are a number of popular models to choose from: TPCK, SAMR or TIM for example. I'd like to focus on SAMR because I like its simplicity and how easily it can be used to generate conversations and reflection among educators. There are many interpretations of SAMR, so let me add my thoughts, based on many conversations I've been fortunate enough to have with Dr. Ruben Puentedura, the creator of the model. If you are not familiar with SAMR, it describes four ways educators use technology for teaching and learning: (S)ubstitution, (A)ugmentation, (M)odification, and (R)edefinition. 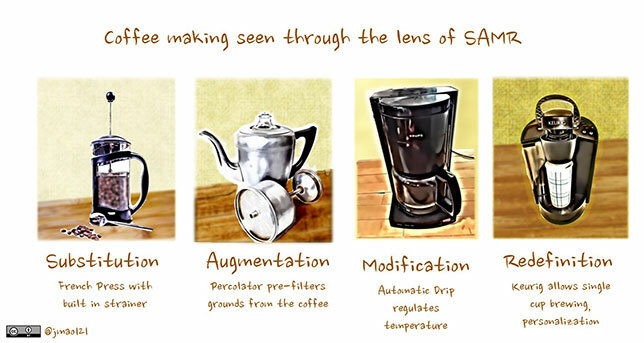 There is a popular graphic that connects SAMR to coffee as a way to illustrate it. I'd like to provide my own coffee-based analogy and focus on the making of the coffee rather than the coffee itself. In the earliest days, coffee was made by boiling water and ground beans together. A simple strainer may have been used to reduce the number of grinds that made it to your cup. Sometime in the 1800s, Europeans began to develop a coffee pot with a built-in strainer that was pressed down to capture the grinds before serving. Today, we call this the device the French press, and I offer it as a substitution of the earliest ways to make coffee. It allows the hot water to steep with the grinds, and has a built in-strainer. In 1865 the coffee percolator was invented and augmented the coffee brewing method. The percolator raises the coffee grinds above the hot water, allowing it bubble up and through the grinds and pre-straining them from the liquid. The problem with the percolator was that it tended to over-extract flavor from the grind. If the water was allowed to reach a full boil, overly bitter coffee resulted. Fortunately, in 1954 the automatic drip coffee maker was invented. This modification further redesigned the process by regulating the water at optimal temperature — boiling water was too hot. The drip coffee machine also made coffee-making a hands-free process. With the rise of coffee shop culture across the U.S., coffee drinkers increasingly seek personalization. The automatic drip machine in the faculty lounge was OK, but it made coffee in large quantities, and everyone knows that if the coffee has been sitting too long, oxidation occurs and again you are left with a bitter cup. The Keurig-style one cup brewing machines redefines the coffee making process. Coffee is brewed one cup at a time, and it allows you to individualize what type of coffee you want. The same machine can also make other hot drinks like tea and cocoa. This examination of coffee making history should help you understand SAMR better. Note that it's open for debate if the percolator was an augmentation or actually a modification, given that the grounds were no longer mixed in the water. It is this squishiness that is, in my opinion, the greatest value of SAMR. As we examine a practice that involves technology, SAMR calls upon us to compare the new method with what was previously done, allowing for different teachers to view these changes from their own perspective. It is evolutionary. In a few years, single-cup brewing will be so common that when a new invention comes along, people will compare it to the Keurig-style machine. In fact, this type of debate is the most valuable aspect of this process. It isn't important (or I would argue, even possible) to arrive at definitive classifications using the SAMR model when you have a group of educators, because perspective matters. The debate allows educators to challenge their thinking and offers the opportunity to reflect upon what others say. The SAMR model does not define one way as better than another (i.e. Modification is not necessarily better than Augmentation), but research and common sense will tell you that if you do not actually change a process through Modification or Redefinition, then expecting a different outcome is unreasonable. The examination of teaching and learning practice is key to understanding how we can improve. As part of the Future Ready Schools Summits, we have facilitated conversations focused on how to use SAMR to challenge thinking and to examine practices. You can download the supporting packet we developed that includes a dozen scenarios designed to spur conversation and create cognitive dissonance. These scenarios should not be considered exemplars! In a group of your peers, read through a scenario, and then take a stand on where you think the new use of technology could be classified in the SAMR model. Compare your thoughts with the group, defend your position, and listen to each other. Then consider what you think is necessary to change or add to the practice in order for you to classify it differently (i.e. modification versus augmentation). I hope that SAMR provides you and your peers a common vocabulary to structure and guide your discussions and explorations. I hope you will find that it aids you to better understand when you are really changing a process. Because then and only then is the expectation of a different outcome reasonable.